During its initial period of operation, the Haddenham `Say No to Mereham' Group was active in supporting and encouraging opposition to the planned development of 5,100 houses at the Mereham site between Wilburton and Stretham on the A10. The developers, Australian company Multiplex Stannifer, now known as Brookfield Multiplex, had huge resources available to them to fight for planning to be granted. All we had were our voices and time, plus whatever donations we obtained from the local community. Nevertheless, our support helped our democratically elected councils to convince the Planning Inspector, Richard Ogier, and the Secretary of State, Hazel Blears, that our case was right and that Mereham was a truly unsustainable proposal. In summary, it was described by the inspector as potentially a dormitory development, with little proven prospect of generating local employment whose traffic impacts would have caused damage to the regional economy. Yet in the last week we have learned that these shameless Australian pirates have had the gall to question once again the decision of our democratic process. They and their paid acolytes, Barton Wilmore, have now put forward Mereham as a potential development to be considered during the review of the Regional Development Plan by the East of England Regional Assembly, EERA. Consequently, we have decided that as a precautionary measure we will not wait until there is another planning application, we are going to resurrect the `Say No to Mereham' group now. We are going to fight every single step these greedy people take, with the objective of not only nipping their awful plans in the bud but also of causing them and their agents as much public disrespect and financial pain as we legally can. We urge anyone who originally supported the Mereham campaign to write to Secretary of State, Hazel Blears asking her to inform the unelected EERA quango that she is not amused that they are apparently giving Multiplex a platform from which to question her and her department's judgement, which was only published on 29th August. The government gave the `Regional Assemblies' the task of developing Regional Spatial Strategies, RSS, but failed to get electorate's authority to turn these organisations into elected bodies. The local RSS, known as the East of England Plan was published in May 2008, so now, in order to give themselves something to do with our money, this quango has started to review the six month old RSS again. "4.1. We are interested in receiving proposals for new sustainable communities and urban neighbourhoods which could range in size from about 2000 dwellings upwards and which may have the potential to reach at least 5000 to 10,000 dwellings by 2031 depending on infrastructure and market thresholds. They could also have the ability to expand further beyond that date. Development could take the form of extensions to existing settlements or be stand alone new settlements. In the case of the latter, it should be noted that experience within the region and existing guidance indicates that new settlements need to be large enough to sustain a minimum range of facilities with a minimum threshold being of the order of 4,000 to 6,000 dwellings. 4.2. By `new' we mean that sites already allocated or with planning permission should not be included, although fresh proposals for extensions to such sites, which themselves meet the criteria of the brief, may be submitted. Proposals submitted to local planning authorities in the current plan round, but not yet identified in site specific sites, may be submitted provided they meet the criteria. Proposals which the Secretary of State has already deemed to have an inappropriate location should not be submitted. " Yet last week in a response to the local press, John Reynolds, Chairman of the EERA, was quoted as saying "With Mereham, it may be completely different to the one which has been rejected before. We cannot prejudice a site by saying it has already been rejected - it may be completely different." So which is correct? The original guidance issued by the EERA that rejected sites should not be re-submitted or the statement of its chairman? We would like to know. Meanwhile we will also be asking the EERA which if any of their officers know James Tuckey, Executive Chairman of Multiplex UK and a former Chairman of English Partnerships, and when any member of EERA officers or staff last met with an employee of any Multiplex or associate company or Barton Willmore. It is common knowledge that Multiplex lost so much money on the Wembley Arena project that they had to be rescued by US-listed Brookfield Asset Management but not before they had failed to pay many of their Wembley suppliers, taken avoidance action by suing others and been less than truthful to their Australian shareholders who subsequently started a class action against them. So a fine bunch of people to do business with. Now we have learned that, following the Mereham inquiry, Multiplex, either failed to pay, only partially paid or had to be hounded into paying some organisations from whom they bought services to support their case. We would like to hear from any local supplier who had these difficulties or who is still owed money by Multiplex. We make no secret, we are building a case to prove to any future inquiry that Multiplex is not a fit company to trust with any form of development. Please email the Haddenham or Wilburton village web sites (this website). The Mereham inquiry demonstrated clearly that Barton Wilmore personnel had little real heart for Mereham. Their case was less than complete, their choice of experts often questionable and the briefing of their experts often partial. In a way we feel sorry for them. Maybe they are only continuing now because Multiplex wouldn't pay them! Nevertheless our sympathy is limited and we promise that we will do everything we can to ensure that they lose again and lose a lot of money doing it. We are collating a file on Barton Wilmore and its activities and we would welcome any information that anyone can provide. Please email the Haddenham or Wilburton village web sites. In conclusion, the Say No to Mereham campaign is alive and kicking. We will take every avenue of legal action open to us to ensure that this ill-conceived scheme never comes to fruition and we will continue to support our elected representatives in their fight against it. We will also support the District Council in developing their plans for controlled and structured development within East Cambridgeshire which have been properly debated within our community. We wholeheartedly support the comments in the Press Release by the Haddenham "Say No To Mereham" Group - and would encourage anyone who has information regarding non payment by Multiplex (or their agents, Barton Willmore) - or any information about dealing with Barton Willmore to contact us. We will respect your privacy and will never display or pass your identity or details. If you have been approached by Multiplex or their agents or representatives over Mereham for any other reason, we'd also like to hear from you. We would like to expose any under hand tactics that may have been used - and expose the companies behind them. Barton Willmore took the gloves off by submitting Mereham to the EERA, but we're happy to join in the fight, and it would seem appropriate after the recent rain to do our own mud-slinging. As for John Reynolds' comments that the proposal "may be completely different" - if he read the Mereham proposal carefully enough he would have seen it still contained many references to their previous proposal without even correcting the proposed developments name - and it certainly wasn't completely different. So what are the chances of this being completely different? The location will be the same, and that was part of the reason for it to be rejected by the Planning Inspectorate and The Secretary of State. The EERA specifically state those "deemed to have an inappropriate location" should not be submitted. It's clear to us what that means, but obviously not to John Reynolds or Barton Willmore. He of all people should also be aware that developers aren't paying up under Section 106 agreements, which in the case of Mereham would mean no facilities funded by the developer. Perhaps he should "be brave" and force up front payment on all new proposals! He is outlining what Cambridgeshire County Council do for the local community (see BBC News link) - perhaps he ought to be supporting them and the local community against Mereham? If you do write to him, ask him why he doesn't appear to be supporting the local community. Welcome to the Mereham section of the Wilburton website. Our aim is to represent the views of local residents concerning the proposed Mereham development, which will potentially affect the lives of people living in the Wilburton-Stretham region, and beyond to anyone who uses the A10 north of Cambridge, the B1049 Twenty Pence Road through Cottenham and Histon, and other surrounding roads. This map shows the size of the proposed Mereham site compared to Ely - it's going to nearly the size of Ely, with almost as many houses, but without the facilities, infrastructure, or railway line. The only people who will benefit are the developers, who will see huge profits from this, it's a pity they didn't spend a little more money in getting some of their facts right...it would make the proposal appear less of a joke to people who know the real facts locally. November 2007 - The A10 Proposals Have Changed - The developers have completely changed their transport proposals - claiming to have been done on the first day of the inquiry (although daetd at the 8th October). This means that evidence given against the previous proposals, and against the planning application, is less relevent now. This is not the first time David Tucker Associates have puuled this trick during a Public Inquiry - and presumably it is an admission from them that they did not do the job properly in the first place. The aim of these changes is simple - to remove the opposition by the Highways Agency to the proposals as they would affect the A14. See the Latest Updates and Planning Application for more information and where to find the changed documents. And please write to the inspector to object to such late changes that have not been through the appropriate channels for a planning application. We wouldn't be able to get away with it - but then again we would have done the job right in the first instance - not changed our mind to just reduce the objectors to a poor proposal. Say No To Mereham - Public Meeting - Friday 28th Sept, 2007 There will be a public meeting to discuss the Mereham proposals on Friday 28th Sept at St. Peter's Church Hall, Wilburton - 7:30pm. 05 Oct 2007 This site will be 'quiet' for the first week or two of the inquiry, but we're still interested in your comments and questions. We'll try to respond to them as soon as possible. In the mean time let us hope that common sense will prevail over financial greed - and remind all those proposing the Mereham development that their reputations will be put on the line - if they are seen to be giving misguiding evidence we will highlight that on the web, which is a very powerful medium for ending otherwise successful careers. If they stand by their evidence 100% and it contains no misrepresentations, they have nothing to worry about. We assume they are have visited this area and seen what it is really like, as no one can provide true professional responses without true local knowledge. It would appear that the Multiplex documents lack local knowledge though, despite claims to the contrary from their so called experts. The Haddenham website will be reporting on the inquiry. 14 Sep 2007 See Latest Updates for the most recent additions to this websites and other Mereham related information. 06 Aug 2007: Haddenham Parish Council have formed a campaign group - see Haddenham Online for more details. 02 Aug 2007: If you wish to speak at the inquiry at the Arkenstall Centre in Haddenham then you need to attend on the first day - 9th October 2007 - and inform the Planning Inspector and you will be giving a slot of time during the inquiry. We want to get as many people as possible to turn up and register - to help show the total lack of support for this plan locally, and also to help highlight the many failings of these proposals. If you can't make it in person then contact us via this website and we'll see if we can register for you, or at least make sure your objections are known. Do you live in a prominent location in one of the villages that will be affected by this proposal? If so, would you like a "Say No to Mereham" poster? Yes - great - contact us and we'll try to sort one out for you! The next stage of this ludicrous proposal is for it to go to appeal on the 9th October 2007. Despite all the local councils - namely East Cambs, South Cambs, Cambridge City and Cambridgeshire County - being opposed to the development, the appeal is still going ahead. It seems unbelievable that despite all local and regional planning being against this proposal that Multiplex are still wishing to waste our money (via Council Tax) on pursuing such a poorly thought out and investigated proposal. If you attended the public meetings back in November 2005 you would have witnessed for yourself that they were unable (or unwilling) to answer even basic questions about the proposal - and lacked any knowledge of what the current situation is with the A10 (the David Tucker representatives being particularly lacking in local knowledge, or even knowledge of the content of their own transport proposals!). Yet they were apparently able to tell us that they could improve it, although when challenged to demonstrate this they weren't able to. 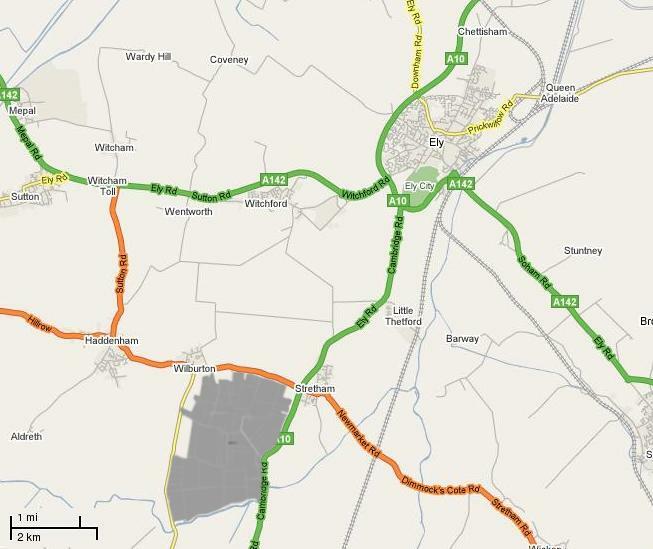 So once again we are in a position of having to defend our wish to live in quiet villages, some distance away from Cambridge (over 11 miles, which is around 18km), from a proposal which will create chaos for anyone living north of Cambridge along the A10. The updated proposal doesn't appear to be ready on the developers website - but will no doubt include lots of mention of affordable housing, a current favourite for MPs (as long as it's not where they live, of course). But who is this to benefit? Certainly not people working in Cambridge - for example Addenbrooke's Hospital is some 15 miles (yes, miles, not km) from the site - and often taking upwards of an hour to get there. Building affordable houses that far away from centres of employment just does not make sense however you look at it. Widening the A10 as in the existing Mereham proposal will just create a more dangerous road - that was obvious to everyone who attended the public exhibition (they being the people who use the road every day). If managers of the railways can be held responsible for the deaths caused on the railways - can we not hold Multiplex managers responsible for the inevitable increase in fatalities that their proposals would create? We do hope so, as then they might actually consider what they are proposing. The reasons for Mereham are purely financial - Multiplex have options on some of the land to buy it cheaply (and rip off the land owners), and sell it on at huge profit. They have been helped along the way by a local estate agent - we won't name them here yet, but if they continue their underhand tactics then we shall, as we feel no one locally should give them business. The development will provide no benefit to those already living in the area, or those using the A10 for their daily commute. Lets work together to stop this - send us your comments so we can include them here. Unlike Multiplex, we will listen to you! We are going to be updating this website over the coming weeks, so why not drop us an email to let us know what you think. New Government Guidelines include 'Sustainable Development in Rural Areas' which states that "New building development in the open countryside away from existing settlements, or outside areas allocated for development in development plans, should be strictly controlled; the Government's overall aim is to protect the countryside for the sake of its intrinsic character and beauty, the diversity of its landscapes, heritage and wildlife, the wealth of its natural resources and so it may be enjoyed by all." Previous Structure Plans concluded that the site "performed poorly in comparison to most other locations" and that "the overwhelming disadvantage of Wilburton ...is its relative remoteness from Cambridge and its poor performance against the RPG6 requirement of promoting a better balance between housing and employment close to Cambridge." East Cambs Council (and common sense) say that the appeal site is poorly related to areas of employment, major health provision, schools and shops and would encourage high levels of car based commuting in order to access these facilities contrary to the principle of developing sustainable communities. We say that the proposal includes development of some shops and businesses - but it won't be enough to stop people going to Ely, Cambridge or Peterborough for shopping - and the empty business units in Ely show that even with a railway station and multiple road accesses, businesses do not want to locate to the more remote business parks. And surely part of the argument FOR Mereham is to provide affordable housing for Cambridge - so including employment on site is AGAINST their own proposal!